The connection between health and nutrition has become more and more topical. Nutrition guidelines such as the Dietary Reference Intakes (DRIs) for the United States and Canada or the Nutrient Reference Values (NRVs) for Australia and New Zealand, specify intakes of essential nutrients considered to be adequate to prevent deficiency states. The question though is, how to best consume these levels. Nutrient deficiency is rather the rule, not the exception. The World Health Organisation (WHO) recommends eating 0.6 to 1.2kg of fruits and vegetables a day. This is a fair amount of fruits and vegetables and not everyone is able to consume or even be able to afford buying such quantities on a regular basis. High quality products and a good variety of them is a key to getting all the nutrients our body needs for basic functioning. However, our intake might be limited because of our personal taste preferences; it is not easy to eat certain things just because they are good for us while we simply cannot enjoy the flavour or texture of it. We also need to consider that, although most fruits and vegetables are nowadays available all year round, unripe harvesting, transport, storage, handling and preparation do affect their nutritional value. It appears to be very difficult, if not impossible, to meet our needs by diet alone. Supplementation in addition to a healthy diet and lifestyle becomes more and more advisable. Our economy reacted accordingly and produced a vast amount of nutritional supplements. 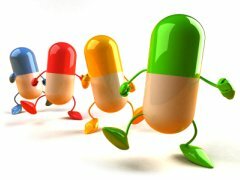 However, not all supplements are the same and comparing products can be quite a daunting process. It can be difficult to determine to what degree a supplement is indeed natural or synthetic. The general understanding is that the active ingredients of natural vitamin supplements are sourced and concentrated from natural ingredients while the active ingredients of synthetic vitamin supplements are manufactured by chemical synthesis from non-nutrient ingredients. It would make sense to believe that natural vitamins are superior, safer, and more effective than synthetic vitamins but this is only true for some essential nutrients. The major benefit of natural vitamins is that they occur in nature with other nutrients that enhance the absorption and efficacy of the vitamin. Many of these beneficial interactions are still not fully explored. Raw materials organically grown have been found to have greater numbers of nutrients, as well as fewer pesticides and chemical residues. Most Vitamins are now available as synthetic compounds identical to their natural substance and are generally less expensive. Our body is unable to distinguish between a synthetically derived vitamin molecule and one derived from a natural food source. This is certainly true for Vitamin C. The bioavailability of ascorbic acid naturally found in foods or in the form of a supplement has not been shown to be significantly different from that of pure synthetic ascorbic acid. Vitamin B9 or Folate is very unstable in its natural form and loses its activity in foods within a few days or weeks while synthetic Vitamin B9 or Folic Acid is almost completely stable and provides a bioavailability of close to 100%. Also the absorption of naturally occurring Vitamin K is poor and can be as little as 10% compared to the absorption of a supplement form. However, the synthetic derivative Vitamin K3 (menadione) has been associated with potentially severe toxicity reactions at high doses, particularly in infants and other highly vulnerable populations. Vitamin E on the other hand appears to be twice as efficient in its natural form than in its synthetic form which needs to be taken into consideration when taking a supplement. Carotenoids are acting the same way by being a powerful antioxidant in their natural form but not quite so powerful in their synthetic form. Manufacturing processes, combinations of ingredients, and the growing of the raw materials can all influence the quality of a supplement. The majority of vitamin and mineral supplements start with the same raw material but how they are put together can alter the quality of the end product. One important issue is, for example, how much of a product is made up of inactive substances that are used to bind the active ingredients into a supplement. As manufacturers are only required by law to disclose the active ingredients in nutritional supplements, we may not know what the inactive ingredients are. Most reputable vitamin manufacturers or distributors however either voluntarily include this information on the label or they employ support staff to answer questions regarding their products. Raw materials organically grown have been found to have greater numbers of nutrients, as well as fewer pesticides and chemical residues. Combining ingredients in the ideal relationship can tremendously improve the quality of a supplement because nutrients work together synergistically; in other words, they work as a huge network and as such improve the efficacy of active ingredients. The source of a nutrient can affect the potential risk of nutrient intakes that exceed the Tolerable Upper Intake Level (UL). For several nutrients, there is no known risk of excessive intake from natural foods. The Upper Intake Level (UL) for nutrients such as magnesium, Vitamin B9 (Folate), Vitamin B3 (Niacin), and Vitamin E are based only on chemical or synthetic forms obtained from supplements or added to foods (IOM 1997, 1998a, 2000b). Excessive intakes for other nutrients such as calcium, selenium, iron, and Vitamin C and D are based on the combination of intakes from food and supplements (IOM 1997, 2000b, 2001). Packaging of a product is another issue to consider. For example Vitamin A, B1, B3, B6, B9, C, D and E, are vulnerable to light and heat. These should be sold in dark coloured containers to protect them from light, and stored away from sunlight and heat. Supplements can be more easily administered than the equal amount of fruits and vegetables, enabling the optimum intake of nutrients that foods alone may not provide. However, supplements should not be used as a substitute for a diversified diet! Taken as a group in proper doses in addition to a healthy diet and lifestyle, supplements can have tremendously positive effects in supporting optimum health. For more recommendations, please visit our Online-Shop.